There are no requirements for this course – all are eligble, as long as you don’t already hold the 2382-15 qualification. A working knowledge of electricity and wiring is beneficial, but isn’t essential. We highly recommend this course to anyone who is not yet trained to Amendment 3 standards. Please note: you will require a copy of the new 3rd Amendment Wiring Regulations book for this 17th edition course. For those already with the green book, PASS will provide you with a copy of the yellow book during the course. You can buy a copy of the book from our test equipment website, Tester.co.uk. 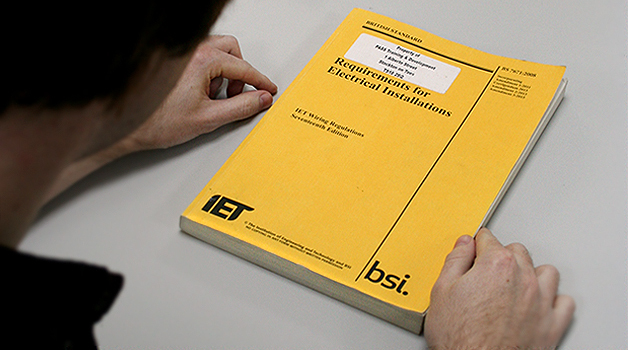 Candidates will study the latest standards of the IET Wiring Regulations, using the current book as a basis. The Amendment 3 section will also reference Part 2 Defintions – ‘Cmin’ Factor and Condition Reports. When you’ve completed each module, you’ll be required to sit a multiple-choice, open-book examination. You’ll be able to use your IET Wiring Regulations book in this exam. This course takes place at our electrical training centre in Hull. Alternatively call us directly with any questions you might have. This essential training course will teach you the fundamental requirements of the 17th Edition Wiring Regulations. Based at our electrical training centre in Hull, you’ll study the latest requirements made under Amendment 3 of the Wiring Regs to ensure you’re fully compliant and working up to date. This is a classroom-based training course with no practical elements; you will focus on learning and understanding the requirements of the regulations in the classroom, then be expected to take a multiple-choice examination at the end to confirm what you’ve learned during the training. There are no formal entry requirements for this course; both new and existing electricians (or aspiring electricians) from the Hull area who are not yet qualified to Amendment 3 of the IET Wiring Regulations 17th edition should take this training course. Note: if you already have a prior 17th edition course without Amendment 3, you are required to complete this course to remain in full compliance with regulations.